Why rent a house or cottage or multiple motel rooms when you can experience the hospitality of the Presque Isle Lodge? The Presque Isle Lodge built in 1920 is listed on the National Register of Historic Places. We do not claim to be fancy or elegant (too pretentious for us! ), but we promise genuine comforts, warm hospitality, and a memorable experience. By renting the whole Lodge, you can save money and gain privacy, a win-win! A gathering with friends and family is better with the comforts and intimacy of a home and the spaciousness and ease of a hotel. At the Lodge, we offer you both. With the Whole Lodge Rental, you can fill our bedrooms with your favorite people, then socialize and gather in our spacious common room and dining room. Play board games, ping pong, swim in Grand Lake, relax on the wrap-around porch or visit the area lighthouses. The list goes on and on. Just generally creating the memories that make up the special moments in our lives. There is plenty of private space to be on your own. Groups enjoy our BYOB policy – you save money and the hassle of finding a Designated Driver when you bring your own beverages to the Lodge. Rent the entire bed & breakfast inn for your family reunions, friends get-a-ways, small intimate weddings, corporate retreats, office parties, birthdays, college reunions, Girls Getaways or other groups! The main level of the Lodge has a spacious living area with a large stone fireplace where guests can watch movies, read, play games, or simply hang out. There’s also a wraparound porch where guests can play ping pong or swing on the hammock. The lakeshore provides a raft, picnic table, seating, dock, canoe, and kayak to provide a welcome respite on a hot summer day. Eight uniquely decorated rooms and one suite offer a variety of bedding arrangements. The kitchen is fully equipped with a large “cold station” refrigerator and an 10-burner stove top with two ovens as well as a microwave which is perfect for cooking up a small feast. The large dining room is perfect to serve it. There is also a large event grill. 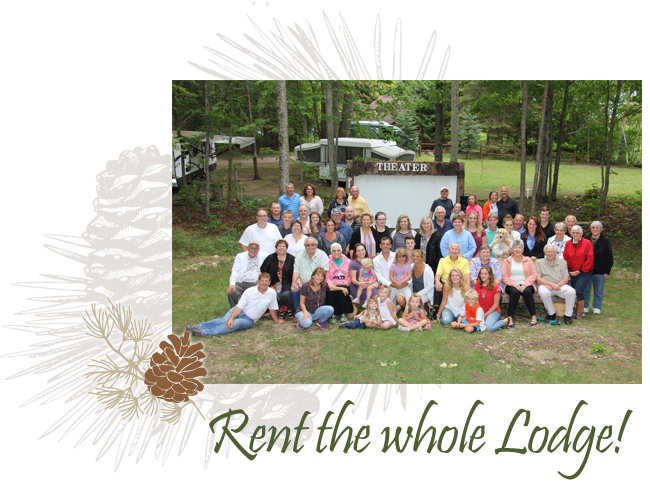 If you are interested in the Whole Lodge Rental options please call (989) 595-6970 (summer) and (231) 929-4684 (winter) or email innkeeper@presqueislelodge.com. To receive our Whole Lodge Rental benefits, you must commit to rental of all rooms which are discounted. There is a two-night minimum for the Whole Lodge Rental on weekends. Copyright © RKcom Web Design 2018 All rights reserved.